To see reviews, ratings, other places to visit, and more tourist information, read Fitzroy Island attractions website . London, UK to Fitzroy Island is an approximately 28-hour flight. The time zone difference when traveling from London to Fitzroy Island is 10 hours. Plan for much warmer temperatures traveling from London in April, with highs in Fitzroy Island at 34°C and lows at 25°C. You'll set off for Uluru-Kata Tjuta National Park on the 1st (Mon). Uluru-Kata Tjuta National Park is known for nature, museums, outdoors, trails, and classes. Your plan includes some of its best attractions: don't miss a visit to Uluru, browse the exhibits of Walkatjara Art, stroll through Uluru Hiking Path, and appreciate the views at Valley of the Winds. To see other places to visit, where to stay, ratings, and tourist information, use the Uluru-Kata Tjuta National Park trip maker app . Use the Route module to find suitable travel options from Fitzroy Island to Uluru-Kata Tjuta National Park. Traveling from Fitzroy Island in April, Uluru-Kata Tjuta National Park is little chillier at night with lows of 17°C. Cap off your sightseeing on the 4th (Thu) early enough to travel to Melbourne. Melbourne is known for museums, shopping, parks, nightlife, and zoos & aquariums. Your plan includes some of its best attractions: admire the natural beauty at Royal Botanic Gardens, enjoy breathtaking views from Eureka Skydeck 88, take a tour by water with Melbourne Boat Hire, and admire the masterpieces at National Gallery of Victoria. For where to stay, ratings, reviews, and more tourist information, refer to the Melbourne online travel planner . Fly from Uluru-Kata Tjuta National Park to Melbourne in 5 hours. Alternatively, you can drive. Traveling from Uluru-Kata Tjuta National Park in April, things will get slightly colder in Melbourne: highs are around 23°C and lows about 11°C. Wrap up your sightseeing on the 7th (Sun) early enough to travel to Sydney. Sydney is known for nightlife, trails, beaches, parks, and museums. Your plan includes some of its best attractions: catch a live performance at Sydney Opera House, admire nature's wide array of creatures at Sea Life Sydney Aquarium, appreciate the history behind Mrs Macquarie's Chair, and trek along Bondi to Coogee Beach Coastal Walk. For ratings, reviews, photos, and more tourist information, use the Sydney vacation planner . Getting from Melbourne to Sydney by flight takes about 3.5 hours. Other options: do a combination of shuttle and flight; or drive. Traveling from Melbourne in April, you can expect nighttime temperatures to be somewhat warmer in Sydney, with lows of 17°C. Wrap up your sightseeing on the 10th (Wed) early enough to travel to Whitsunday Island. 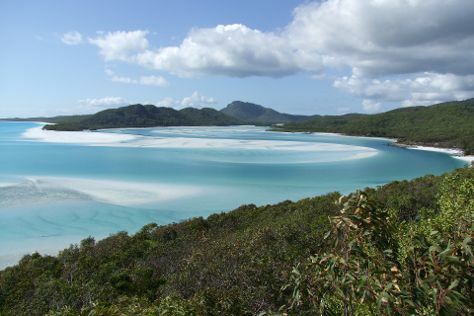 On the 11th (Thu), contemplate the waterfront views at Hill Inlet and then enjoy the sand and surf at Whitehaven Beach. For ratings, reviews, and other tourist information, you can read our Whitsunday Island trip planner . Getting from Sydney to Whitsunday Island by flight takes about 4.5 hours. Other options: do a combination of flight and bus; or take a train. Traveling from Sydney in April, expect Whitsunday Island to be a bit warmer, temps between 32°C and 22°C. Finish your sightseeing early on the 11th (Thu) to allow enough time to travel to Cairns. On the 12th (Fri), discover the deep blue sea with a scuba or snorkeling tour. Here are some ideas for day two: relax in the rural setting at Hartley's Crocodile Adventures and then trek along Esplanade Boardwalk. For ratings, traveler tips, where to stay, and tourist information, refer to the Cairns trip planner . Fly from Whitsunday Island to Cairns in 2 hours. Alternatively, you can do a combination of bus and flight; or take a train. Traveling from Whitsunday Island in April, plan for a bit warmer nights in Cairns, with lows around 26°C. Cap off your sightseeing on the 13th (Sat) early enough to travel back home.